A Frenchman attempting to become the first person to swim across the Pacific Ocean said Wednesday he was resuming his bid, after storms forced him to suspend the ambitious undertaking. "Back in the water today! After avoiding a typhoon we're finally back at the swim point and continuing on with the swim," Ben Lecomte tweeted. Lecomte set off from Choshi in Japan on June 5 and planned to swim across the ocean to San Francisco in six to eight months. But nearly two months into the epic journey, severe storms forced the 51-year-old to head back to port in Japan. He and his team waited out several storm systems swirling through the region during the local typhoon season before heading back this week to where he cut the swim short, slightly more than 580 nautical miles east of Japan. He will be resuming a schedule of swimming for eight hours a day and consuming 8,000 calories daily to keep going. 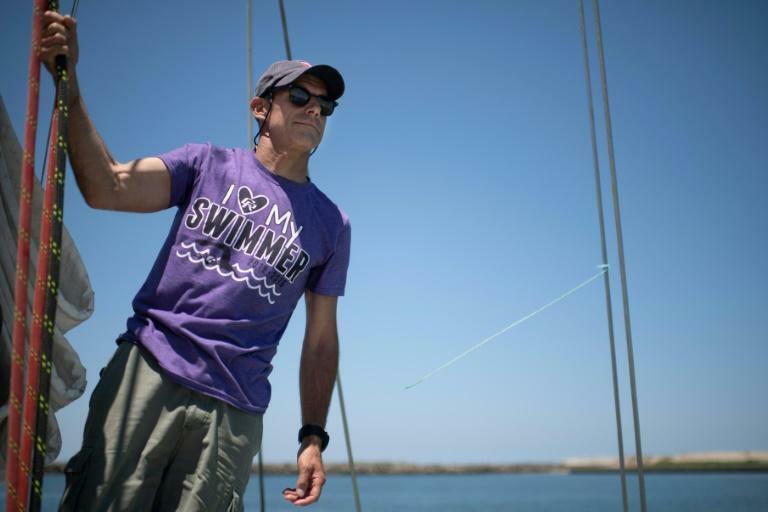 Part adventurer, part environmentalist, Lecomte organised the swim to raise awareness of plastic contamination and ocean pollution. His support team is conducting a series of experiments on the trip, including collecting samples of plastic waste. When he suspended the swim, he said the scale of the pollution his team had already encountered made him all the more determined to complete the journey. "It's more important now than ever that we make it to the Great Garbage Patch," he said, referring to a massive vortex of trash that floats between the US states of Hawaii and California. "I want to show people why our oceans are so important."